As everyone who reads this blog is probably tired of hearing by now, I entered the hobby in late 1979, just before the faddish explosion of popularity of Dungeons & Dragons catapulted it to public consciousness. In the wake of its popularity came a wide variety of articles in newspapers and magazines that talked about this "weird game," often with photographs depicting players sitting around a table on which were arranged a large number of finely painted miniature figures. In retrospect, I can fully understand why this was the case. "Fantasy roleplaying" was a hard concept to get across in an article, so, to ground it a bit, miniatures were highlighted, since they helped make RPGs seem a bit more like the games with which the average person was familiar. Even though the Holmes Blue Book edition of D&D with which I started was insistent on the optional status of miniature figures, I wasn't immune to the lure of these tiny lead statues. Between the mainstream media coverage which linked RPGs to minis and the older guys I knew who played the game and used them, I very quickly came to see a strong link between miniatures and D&D. And of course the link is solidly grounded in history, given that D&D -- and roleplaying more generally -- is an outgrowth of the miniatures wargaming hobby. Plus, nearly every game stores I visited in the late 70s and early 80s always included a glass cabinet where they displayed dozens of fantasy gaming miniatures for the delectation of kids like myself. So, even though I didn't need them, I frequently picked up miniatures to use in my games. While my primary criterion in selecting minis was how cool I thought they looked, always in the back of my mind was Gygax's words in the introduction to the then-new AD&D Dungeon Masters Guide that Grenadier Models figures were "the only ones which comply in all respects to AD&D specifications and the AD&D Monster Manual." As such, I bought a lot of Grenadier's boxed sets and blister packs between 1980 and 1982, when they held the official license for the AD&D line. You can see a rather extensive listing -- with photos -- of Grenadier's offerings here. By today's standards, Grenadier's miniatures are pretty crude, laughably so at times. Even compared to some of their competitors, their sculpts were not always very good. But, for me, the official AD&D seal of approval meant a lot and not merely because I was a ravening TSR fanboy (though I was). What mattered to me is that the miniatures closely matched what I saw in my rulebooks. Thus, Grenadier's goblins and kobolds weren't generic little baddies but baddies that resembled the DCS and Tramp illustrations from my Monster Manual. This fantastical verisimilitude was especially important when it came to D&D-specific creatures like the beholder, the umber hulk, and the rust monster. Grenadier even produced boxed sets that included monsters that appeared only modules, like the yuan-ti, aspis, and cave fisher. By the time Grenadier ceased producing official AD&D figures, I'd largely decided that I neither wanted nor needed to buy miniatures for use with my games. As it was, I mostly used minis as "props" to hold up to my players rather than anything more elaborate. And even when I did make use of cardboard dungeon floorplans, most of my minis remained unpainted and insufficient in number or diversity to represent everything included in my adventures. Still, there was something potent about those Grenadier miniatures, potent enough that, even now, three decades later, I find myself frequently thinking about them and imagining using them at my table alongside contemporary old school sculpts like those of Otherworld Miniatures and Fractured Dimensions (which, coincidentally, is currently trying to raise funds for produce four sets of pig-faced orcs). If that doesn't say something good about Grenadier's body of work, I don't know what does. I like how you point out ubiquitous those glass displays were at the time. I could walk into a hobby store just about anywhere and you'd see lines and lines of professionally painted (or at least to my sloppy eye and hand) of Grenadier, Ral Partha, and Heritage Dungeon Dwellers.. All of those sculpts seem as iconic to me of what D&D felt to me as much as the cardstock covers of TSR's modules. The Ral Partha minis were far better overall... But I did have a soft spot for the "Official" minis... as funky as many of them were. My history of D&D involvement is actually very close to yours, James... I got involved in late 1979/ early 1980, when I was about 9 years old. The first game I ever played (hosted by some college students) had the both Holmes book and the LBBs at the table, if I'm remembering correctly. However, after a brief flirtation with B/X, I threw myself into AD&D and that was my game through the better part of my teen years. I recently picked it all up again... which was actually inspired by my Grenadier minis of all things. My girlfriend and her kids found all my old lead figurines and were fascinated by them. Even more so once I explained there was a whole complex game that went along with them. We played a quick and rough intro session, and it was liked enough that I have since gone back and re-learned all the rules sets, and have been looking for ideas to "borrow" for upcoming adventures. Which is where this blog has come in very handy... ;) Thanks! I remember staring at this box...wondering how did Dungeons and Dragons work? How could you get your mind to think you were there...how did figures fit in? I just couldn't understand. Then I had my Dad buy me the basic set, and the rest is history. I quite happily mix modern minis (eg Reaper, Otherworld, Hasslefree) with older minis (eg Grenadier, Citadel, Ral Partha) despite the (sometimes) disparity in size. I buy what appeals to me and what I think will fit into my campign world(s). First figs I ever painted. Got me started in wargaming. Does anyone know who did the box art? 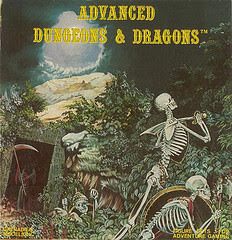 Along with the original hardback rulebook covers, the Grenadier box art really defined the look and feel of Advanced Dungeons and Dragons for me. I always considered the cover art on the Tomb of Spells set, in particular, as being very evocative. I just wish the minis had matched the expectations set by the cover art! BTW, does anyone know where I can find high resolution scans of the cover art for these old boxed sets, especially the Tomb of Spells? I'd really like to get them for a project I just dreamed up (basically, taking a cue from some of the reproduction wood grain OD&D boxes that people are building, I'd like to build a miniatures box using the cool box art from the Grenadier line and maybe fill the box with similar minis but from better quality manufacturers like Ral Partha, Otherworld, Fractured Dimensions, etc.). I've got a cool box but just need a high res scan of Tomb of Spells to commence build. No one has mentioned them yet, but I have quite a few figures from Center Stage Miniatures. I really like their new transparent resin water weird. www.centerstageminis.com. They were at GenCon and have done at least 3 giants module mini combo packs. Cool stuff. I like Otherworld as well. Center Stage looks good. I'm torn between their Water Weird and Otherworlds. Ray Rubin did most of the box art.